This is the basic test for beginners. Nage tests with gentle or gradually increasing pressure. A more advanced test, applied in nage's sight with a hesitation. 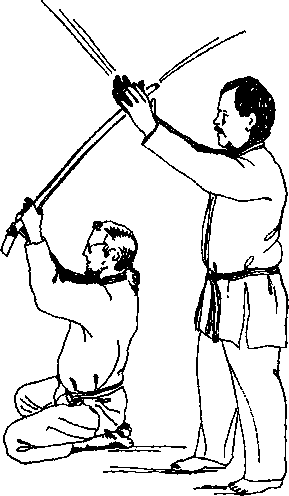 \Jke may place a hand a few inches away from nage's body and wait to see if nage withdraws or moves toward the hand in anticipation..
Beginners commonly approach ki testing by leaning into the test in an attempt to increase mechanical advantage, especially if uke hesitates before testing (Test Two). 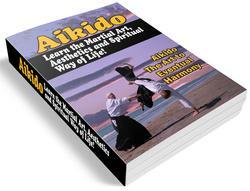 This is the notorious "Magnetic Hand"' — uke holds it out and nage is attracted to it like magic. 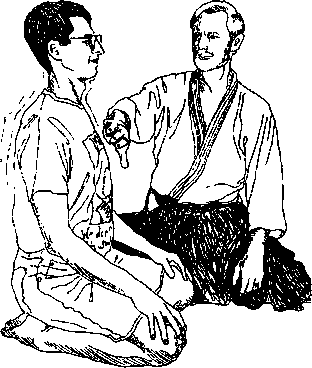 The cure for Magnetic Hand is for uke to immediately test from the rear and lor nage to purposely do this a few times to see that it doesn't work. 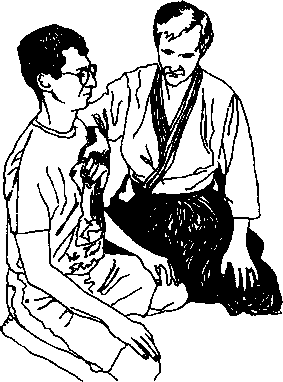 In seiza. ii losing stability, rather than a lean forward, try a bunny hop forward This changes the environment but not the posture.